The Christmas Story. Full of love and light. And innocence. Is there a lovelier sermon than to watch preschoolers re-enact the Christmas story? My two year old granddaughter, Miss Eloise, was a lamb this year in her school program. No lines. But a great pair of ears. It was so much fun to watch her hanging on every word of the beloved ancient story. The lambs, the shepherds, the three wise men, the star. And of course, Mary, Joseph, and Baby Jesus. I could tell she was noticing that everyone had their place in the story. 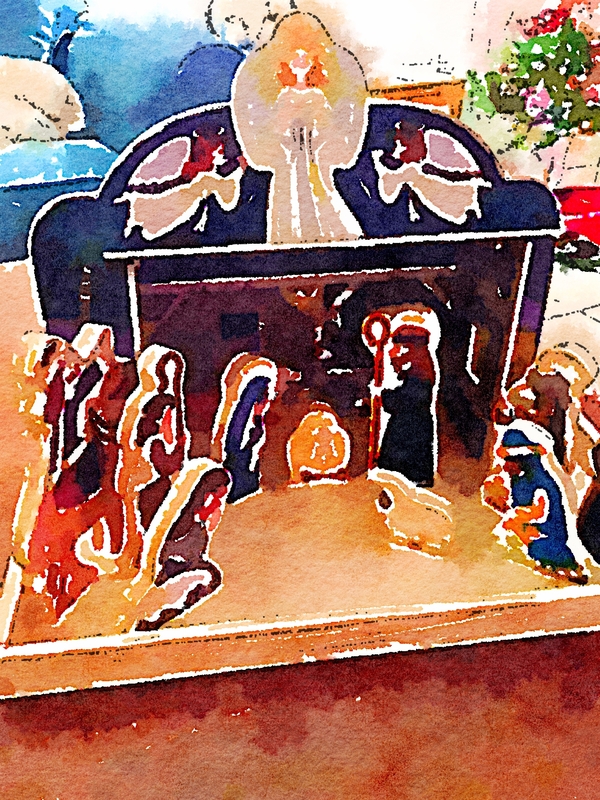 For days later when she would come over she would play school with the nativity scene that sits on my coffee table. Lining the little figurines up, she made sure everyone had their place in the story. And then on Christmas, the ultimate joy for me. Santa brought her her first American Girl Itty Bitty Baby Doll. My heart melted when told me she had named “her” Baby Jesus. That’s what every grandma pastor wants to hear! Christmas through the eyes of children is full of wonder. I know I try every year to re-absorb some of that innocence. There is indeed so much light to the Christmas story. But, there is also darkness. And as drawn as we are to the light, I’m beginning to realize how important it is for me to acknowledge the dark, in order to fully appreciate the light. And that my place in the story also holds darkness. Sometimes a hard thing to admit. We are told that Herod was terrified at the news of the wise men. Terrified to the point that he ordered the infamous slaughter of the innocents. The killing of babies. I can’t think of anything darker. And I’d like to think that this is not part of the story meant for me. Not my story. Not our story. But it’s hard to ignore and even harder to ignore when we are told that “all of Jerusalem” was terrified with him. All of Jerusalem. Seriously?! The place of orthodoxy where the experts on prophecy long awaited the Messiah, the restoration of all things Israel? How could the ones who should have been the happiest about this news be the ones who were terrified? How did they become imprisoned by their own darkness to the point of flinching at the light they so desperately sought? The insiders. The church people. People like me. People like, us. Somehow I can’t so easily separate my story from theirs. Even though I would really like to. So, if I can’t run from the fact that, as a so called insider in faith, I must somehow share in the darkness if I am going to share in the light, I must sit with it awhile in hopes that God will meet me here. That God will show me my place in the story. So, I look at why they were terrified. Well, Herod was simply a bad dude. A narcissist, if they understood that term then. A bully. Egomaniac. He was bent on control, and squashing any attempt to threaten his status quo. The complete opposite of the vulnerability and connectedness of a newborn baby. Need for control. Determine to keep the status quo. Would use any measures to maintain power structure. Not my story. Not the Church’s story…hmmm. And, what about all of Jerusalem? How could they be terrified of the good news they had been waiting for, yearning for, for hundreds of years?? What could they be afraid of in a tiny little baby? And how can their fear possibly have anything to do with me? With us? Well, to say that a baby messes with the status quo might just be the understatement of the year. A baby changes everything. Requires everything. Demands everything. A baby turns life as we know it upside down as she ushers us into a new reality. Living in to the reality of a new baby requires us to participate in the most dirty word of all……change. (small pun intended) Living in to the reality of a new baby forces us to let go of controlling the way things are right here in the now. And living in to the reality of a new baby forces us to walk in faith as we share life with one whose future we can’t determine, as together we walk in uncertainty. Maybe there was a dawning for the insiders in Jerusalem that, if this indeed was the long awaited Messiah, everything was about to change. There would be an end to life as they knew it. And even though they had hoped for the Messiah, for the breakthrough, for deliverance, they had become quite accustomed to living in the shadows of an oppressive system in order to protect the status quo. Living in those shadows was the way they had been able to maintain the safety of business as usual. They had found their place in the story in maintaining the status quo. In surviving in the shadows. The safety of their system of rules, declaring who was in and who was out. To upset the status quo would mean to face change and uncertainty. It would require everything. Even though it was Herod and not the insiders of Jerusalem who ordered the slaughter of innocents in an effort to kill “the” baby, there can be no denying that these insiders would be complicit in the crucifixion of the man. So now there is a darkness that I can’t deny. Because, you see, I realize that in some way, I too share in this darkness, perhaps all too often walk in it. Perhaps there is a question I must ask myself. Have I too participated in killing the baby? Now, before you go and call the cops on me, of course I love babies. I would gladly lay down my life for my two grand babies. They are my source of joy. But I do have to be honest and when I look at my life I can see where I have been guilty of resisting the new things that God plants in my heart, resisting the change these births of promise would require. On May 10 1997 I received my call to ministry. It was a Holy Spirit moment that was a sensing deep in my gut. It was an interruption of God’s love that announced a new purpose I could never have imagined. It was the birth of new promise in my life. I was ordained as a Minister of Word and Sacrament on July 17, 2011. There’s fourteen years, two months, and seven days in between those two moments. A couple of weeks ago at the Episcopal church I have been attending (where the lightening struck) (where I preached last Sunday!) we celebrated in worship by singing the Beatles’ Let It Be. It was awesome. I long to sing The Long and Winding Road. Because that has been my call journey. Oh there have been circumstances beyond my control that delayed the journey, But honestly most of my delay has been me….trying subconsciously and maybe even at times consciously to ….kill the baby. This birth of promise in my life, although amazing and beautiful was scary. My life was already full and fulfilling. Would there be the room that this call would require? It was easy to see early on that it would require everything. And not just for me, but for my family. This interruption of grace would require an upheaval to the status quo and a demand for change and walking in uncertainty. It would require a faith beyond my capabilities. It would require a connected-ness beyond my willingness. I am not worthy. What if I fail? My fears ranged from the fear of lack of confidence to the fear of losing control. Pride. Laziness. I experienced them all. So, I confess now that I guess I really do have to share in the darkness of this story. But, even as I have acknowledged this, perhaps even more significantly I recognize that God’s protection has been with me all the way. And by the same power that raised Jesus from the dead, I have been given, over and over again new life and new energy for the journey. In the present I am honestly refreshed in a call that has turned out way different than I could have imagined. And, with both its ups and downs….way better. So, I want to gently ask you the question….are there areas in your life where you are resisting, maybe even trying to kill the baby? Is God stirring something in you that will require you to walk out in faith and courage? Or something God is stirring in you that will require perseverance in the path you are now on? Are you resisting what it will take to walk in the promise of new life, new ideas, new attitudes? Are you resisting God’s new call on your life today? But, here’s the good news. Just as Joseph was able to protect the Christ child through the warnings and protection of a dream, God still reaches into our lives to protect, nurture, and grow those things that are placed in our hearts today. So, while we may be prone to deny, resist, and even harm the promise of life….God’s love and protection are there for the saving, there for the growing, there for the living. Even when we give up on ourselves, God does not give up on us. And the resurrection power of God is right there for the having. Right there in your heart lives the power of the Holy Spirit which has come to us as a gift. We’ll experience it’s beauty as we let go of our grip, and allow the embrace of God’s grace. Oh, that we might have the ears and heart of Joseph. That we might listen and follow the dream. This entry was posted in Faith, Lessons Learned, Life, Spirituality, unconditional love and tagged Christianity, darkness, dream, epiphany, faith, grace, Jesus, lessonslearned, light, nativity, wisemen. Bookmark the permalink.